I must apologize for my falling off the face of the blogosphere recently. My blogroll is intimidating and starting to be quite overwhleming! I've been so busy and running around, trying to get ready for the big move! I have my appointment for my visa next tuesday and i'm just about all set. I'll soon be getting back to my regular blogging habits and certainly getting back to your lovely comments and to all your engaging blogs. 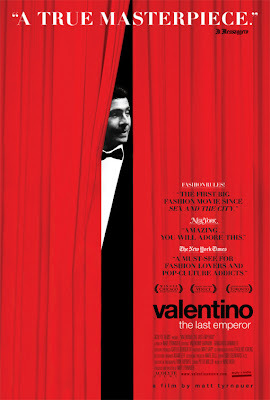 On a side note, i went to see Valentino: The Last Emperor on Monday and it was so delightful! A feel good movie from beginning to end with a peek into what really goes on behind the scenes. Valentino is such a diva, but an ever so endearing one and you can't help but fall for his [unwillingly humorous] unreasonable demands and ways of talking to people. It's probably the most annoying thing in real life, but on screen it makes for the funniest incidences and especially extremely entertaining sequence of events. I had shivers from start to finish, as the movie's opening cresdits are set with scenes of his Fall 07 show and Kim Carnes' Bette Davis Eyes. Amazing! good luck with your move. i just moved from australia to america - such a huge step! luckily, you are going from montreal, one of my favourite cities, to paris, another one.. you'll be fine and it will be perfect! oo i'm dying to see this. ..haha i'm dying for a pair of real pants but i've found nothing i've liked and i'm bored with jeans. i'm dying for those crazy vinyl pants erin wasson wears all the time. have you seen them? amazing.